Published: May 3, 2013 at 04:04 p.m. Updated: May 4, 2013 at 10:00 p.m.
After investigating Daryl Washington for an alleged domestic dispute Wednesday, Phoenix police opted to arrest the Arizona Cardinals linebacker. 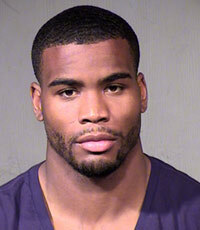 Washington was booked on two counts of aggravated assault, according to Maricopa County court records Friday. Washington's bond was set at $4,200, according to The Associated Press, and Maricopa County Sheriff's Department said he was released from custody at 12:45 p.m. local time. The charges stem from an incident where Washington allegedly assaulted his ex-girlfriend, whom authorities said is the mother of his baby daughter. A probable cause statement released by Phoenix police said Washington's ex-girlfriend claimed he grabbed her by the throat and shoved her to the ground following an argument at her apartment Wednesday. The woman told police that Washington also pushed her with two hands, causing her to fall and break her right collarbone, according to court documents. Police later interviewed the woman, and their report noted her clavicle injury along with "road-rash type of scrapes, bruising and cuts to her right arm, right hip and right leg," according to The AP. This has been a disastrous offseason for Washington, who is coming off a second-team All-Pro selection. It was only a month ago that he was suspended four games for violating the NFL's substance-abuse policy. Washington's offseason actions could have major repercussions in 2014. In addition to a $2.9 million base contract, Washington is due a whopping $10 million roster bonus next offseason. If Washington's recent actions keep him from making much of an impact this season, the Cardinals might consider cutting ties or pressuring him to accept a restructured contract. UPDATE: Washington later released a statement, via the Cardinals' official website: "This is a legal matter and I am limited in what I can say other than that my lawyer and I will continue to cooperate with investigators and welcome the opportunity for all the facts to be presented. I regret that the situation has brought this kind of attention to my family and my team. I look forward to resolving it as soon as possible."